Fresh off the credit rating downgrades of Greece and Spain in late 2009, the euro continued to slide lower down the charts for the first quarter of the year. Greece had been racking up government debt like it was going out of style, raising its risk of defaulting. So, for the first time in 10 years, Greece’s rating fell below A as Fitch and S&P downgraded Greece’s rating to BBB+ from A-. Once again, Europe’s debt crisis hit the limelight. S&P began dishing out more downgrades, lowering Portugal’s rating two notches from A+ to A-. It wasn’t done with Greece yet, either. S&P further dropped the credit rating of Greek government debt to junk status, before deciding to give Spain a downgrade because of its slow growth outlook. The euro sprung back to life midyear as euro zone finance ministers finally decided to approve the bailout package for Greece. In exchange for budget cuts of 30 billion EUR over three years, the EU and the IMF will lend Greece 110 billion EUR. European policy makers also created the European Financial Stability Facility to help calm fears about a debt contagion spreading beyond Greece. European banks were also subjected to stress tests, which aimed to assess their ability to withstand a debt crisis. Out of 91 banks tested, only 7 failed, raising doubts about the thoroughness of the tests. 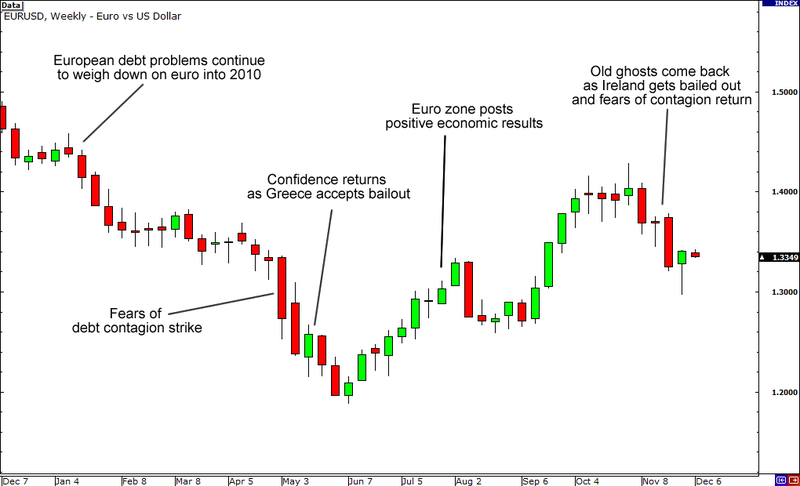 Nevertheless, the euro continued to rally! After weeks of showing positive economic data, the euro zone economies finally showed some muscle. Hungary and Spain had just held successful bond auctions, and Germany and France, the region’s two largest economies, were posting upbeat economic figures. Even the European Central Bank began to feel optimistic, saying it was contemplating cutting back on its emergency bond purchases. Just when the world thought the euro zone was in the clear, Ireland brought back old ghosts. After it received a couple debt rating cuts earlier in the quarter, it was revealed that Ireland would need massive budget cuts in order to trim its deficit according to its agreement with the European Union. Soon after, Ireland took on a bailout of its own, stoking fears that other debt-ridden countries may follow. Investors eyed Portugal, Spain, and Italy as possible recipients of a bailout, which prompted them to trigger another round of euro selling. Whew, what a year for the eurozone, huh? Now that we’re in the holiday season, the focus on the sovereign debt issues has temporarily shifted to holiday shopping and eating with family and friends. But that doesn’t mean the problems have gone away, so in 2011, look for the focus return back to whether or not a solution can be found for the mountainous debt piling up in the EU…Stay tuned!